The Intergovernmental Committee for the Safeguarding of Intangible Heritage, holding its 8th session until December 7 in the Azerbaijani capital Baku, last night inscribed 14 elements on the Representative List of the Intangible Cultural Heritage of Humanity. A screengrab from youtube. A screengrab from youtube. The list serves to raise awareness of intangible heritage and provide recognition to communities’ traditions and know-how that reflect their cultural diversity. “Sankirtana encompasses an array of arts performed to mark religious occasions and various stages in the life of the Vaishnava people. Drummers and singer-dancers enact the lives and deeds of Krishna through devotional songs that often produce an ecstatic reaction among devotees,” UNESCO said of the Indian art form. 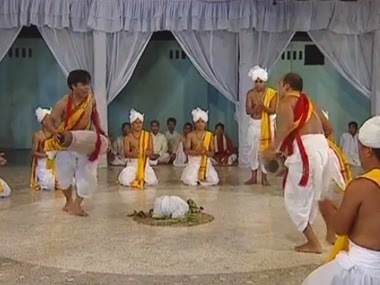 “Sankirtana takes place on public festive and religious occasions that unite the community, and is also performed to commemorate individual life-cycle ceremonies. The whole society is involved in its safeguarding, with the specific knowledge and skills traditionally transmitted from mentor to disciple,” it said. The other heritages include the traditional use of the abacus for counting in China and a Christian festival in the French region of Limousin. Other additions are Belgian horseback shrimp fishing, the annual pilgrimage to the mausoleum of Sidi Abd el-Qader Ben Mohammed in Algeria; Taureg Imzad music; the Cirio de Nazare religious festival in Brazil; a central Italian Catholic procession; an Orthodox holiday in Ethiopia and a Kyrgyz epic poem. Ancient Georgian traditional Qvevri wine-making method, a naming tradition common amongst the people of Western Uganda and Mongolian calligraphy also made it to the list. Washoku cooking methods was among 14 new entries added to UNESCO’s list of “intangible heritage” in need of being preserved.